Madrid, Spain (CNN) -- The United Kingdom has "no doubt" about its sovereignty of the Falkland Islands, a British government minister said Tuesday. The response comes after Argentine President Cristina Kirchner requested new talks with Britain over the disputed islands, which lie off Argentina's coast in the South Atlantic. Speaking at a summit in Spain for countries of Europe, Latin America, and the Caribbean, British Foreign Office minister Jeremy Browne said British sovereignty is supported by the European Union. "We have no doubt about our sovereignty over the Falkland Islands," said Browne, who is Britain's minister of state for Latin America. "The principle of self-determination as set out in the U.N. charter applies. There cannot be negotiation on sovereignty unless and until the Falkland Islanders so wish." Kirchner asked at the summit that the United Kingdom open negotiations on the islands, repeating a request she first issued Friday to the new British government. The Falklands are known in Argentina as the Malvinas. "Let's please resume our negotiations in relation to sovereignty of the Malvinas Islands, as mandated by the resolution dictated in the United Nations since 1965 and which remains unenforced," Kirchner said, according to Argentina's TELAM news agency. The 1965 U.N. resolution invites the British and Argentinian governments to negotiate and find a peaceful solution to the dispute over the islands. Kirchner called the return to talks "an exercise in multilateralism that we need so much in the global political and economic order," TELAM said. Discussions about the Falklands were not overshadowing other issues, however, Browne said. "While we disagree with Argentina over the Falkland Islands, we have a close and productive relationship on a range of other issues, including on economic issues in the G20 and on climate change, sustainable development and counter-proliferation," he said. The islands have been under British rule since 1833. Argentina invaded the Falklands in 1982, prompting a war in which more than 600 Argentinian and 255 British military personnel died. Britain keeps a military presence on the islands, and the Falkland Islands government -- representing a population of about 2,500 -- says it remains committed to British sovereignty. 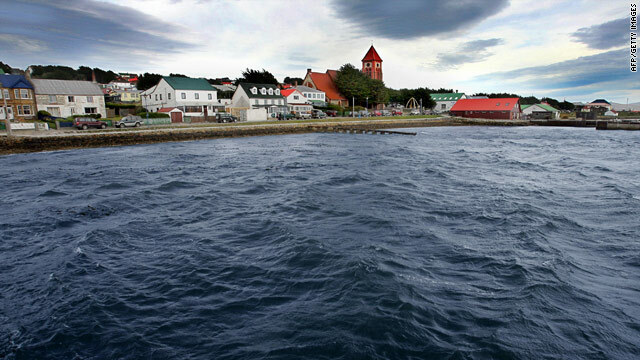 The dispute was rekindled in February after a British oil rig started drilling in the North Falkland Basin, about 60 miles (100 kilometers) north of the islands. CNN's Arthur Brice in Atlanta, Georgia, contributed to this report.